Note the very distinctive overall white appearance of the Male Smew in Winter. The black eye patch and grey flanks all combine to make this Male unmistakable. 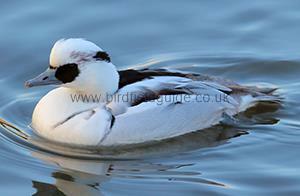 The Male Smew in Winter is a stunningly beautiful white and black duck. It has a black eye patch with light grey flanks and fine black lines across its body. 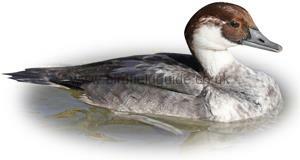 The Smew is a small compact diving duck with a steep forehead and a small bill. The Smew breeds in remote arctic forests near water. At its Wintering grounds, it can turn up on almost any reservoir, pond or estuary. Sometimes it Winters well inland away from the sea. Breeds mainly in the Very North of Europe across to Siberia. A rare Winter visitor to the UK with less than 200 birds being recorded every Winter. Population numbers of Smew are a concern as they appear to be falling for an unknown reason. The Smew is a social bird often seen in small flocks where it is more common. In the UK, it is most likely to be seen on its own, often with Goldeneye ducks which it is known to occasionally hybridise with. The Smews main food is small fish and insects which it dives for. 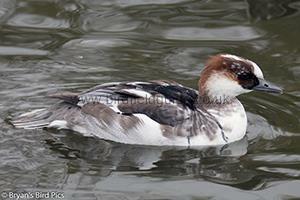 The Male Smew in Summer looks very like the Female (see below). This bird was photographed in October when the moult to Winter plumage had begun. Note the dark eye patch forming. The Juvenile bird can also look like this; However, the fine black body lines are just visible on this bird, indicating an adult Male. 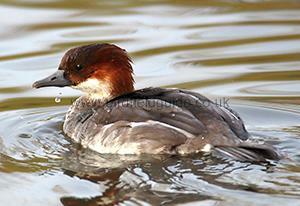 The Female Smew is a small compact bird with a brown head and neck and distinctive bright white cheeks. The Male in Summer looks almost identical. Note the rich brown head and white cheeks of this Female Smew. The dark grey body is very compact and is smaller than the Male, being not much bigger than a Teal.